Stay informed with breaking local, national and global headlines directly from the world’s definitive source for news. 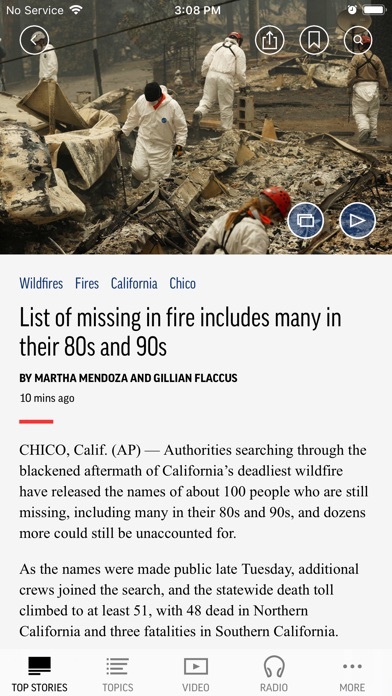 Available on the iPhone, iPad and Apple Watch, AP News by The Associated Press features a personalized experience containing: * A feed with developing stories from your followed topics. * Customized news alerts tailored to your interests. 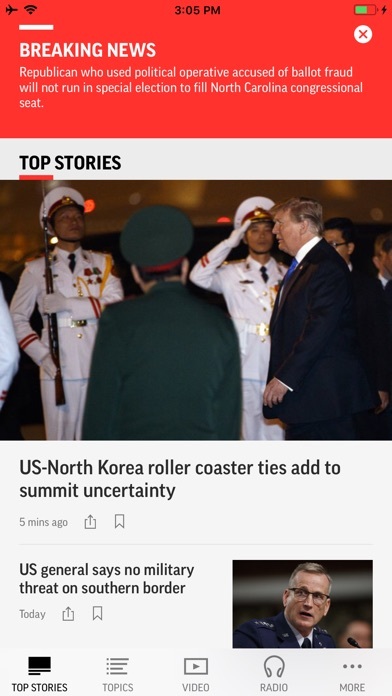 * Curated content hubs for deeper insights into major news events and story lines. * Award-winning photos, videos and articles from around the world. * Local-interest stories from newspapers and broadcasters. 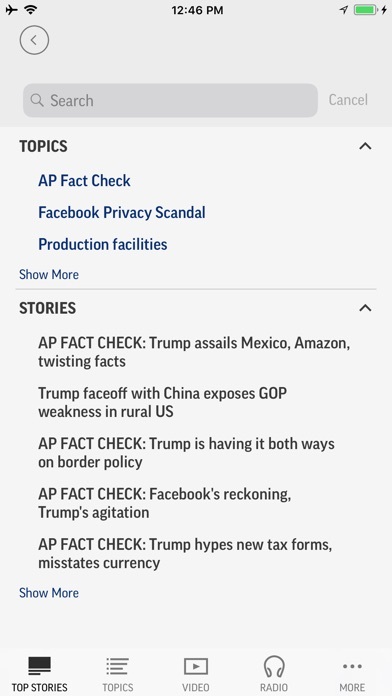 AP News has rebranded itself as American Pravda. The articles are written under the direction of their DNC handlers and push their anti-American agenda. This is a good platform, but the people that run it are bias against the Current administration. They go out of their way to report form a negative point. Just report the facts, don't add opinions or spins. I can make my own conclusions. Im deleting the app. I felt like it wasn’t very accurate. Slanted and bias. I have throughly this app for the last couple years. Ads weren’t intrusive and UI was good. Recently as I scroll through an article, which you imaging is a couple times, I get pop-ads. Understanding the ad banner below if click would pop up an ad, I don’t click near it, but now it pop-ups on its own. I don’t mind ads only when they’re disruptive. I cannot make it through a single article without it freezing, then I have to close app and restart (waste of battery) and let it freeze 2 or 3 times to read an article. This app has become trashier the more they figure ways to stick ads in. Newspapers are dead you’re nuts to think ad revenue you generate actually has value. I’d really like to be able to get local news without the app requiring access to my location. My location is irrelevant. I subscribe to a local paper. The ‘local’ news I’m interested in reading via an app is the news where my family is; not where I am. In trying to automate preferences, you’re making it impossible for me to get what I want to see. This used to be my favorite news app. For the past 2 weeks, every article had had this same obnoxious car banner ad at the bottom of each article, which increases to take up 25% of the screen as you scroll down. It had been annoying me more and more, and once it happened twice in the same article (even after X-ing it out to prevent the increase), I just deleted the app. I would pay $5 a month to get rid of ads. They’re just so obstructive. Or I would be fine if they just didn’t increase in size. Really disappointed, this used to be my favorite reading source. I always the professionalism of their reporting. Ads are kinda ruining it for me TBH. It's not right-wing/left-wing stuff. It's a formerly respectable news organization blatantly disguising ads as news. Fortunately the first ad is discretely labeled as such, but the others in that group are not. This heightens the illusion of legitimacy created by formatting ads exactly the same as actual news. Ad videos pop up that you can’t stop. Even after you stop at once it keeps coming back. No matter how many times you stop the ad it comes back. Even if you watch the ad and then close it it comes back. I am deleting this app. The latest change to ads is abysmal. A stupid auto playing video that you can minimize if you manage to hit the TINY x in the corner, but will continually pop back up as you scroll. I’ve used this app for years and am ready to uninstall it. Having ads is fine, but having ads you choose to make THIS intrusive is unacceptable. Please offer an ad free version. Too many pop-ups. Need a comment section on each story! It covers more news around the world than most American mainstream news networks. I have used this app for years. It is a great source of relatively unbiased objective news reporting. Whether your own views are right, left, or center, this has been a useful app to gather information. However they now have pop-up videos run all the time. Even after you dismiss the video, a few seconds later it will initiate again. And it’s designed to be difficult to dismiss such that often it launches a whole new page from the advertiser. Collectively it is now extremely difficult to stay focused on the content with the constant interruptions. The ads man. When I catch up on the news I don’t want to see a banner ad at the bottom of my screen. Now I definitely know it’s unrealistic to ask for them to be completely gone but I have a couple ideas on how you can change your ad format to make it more enjoyable for the viewers in the future. 1) Keep your current ad format but get rid of them in the articles. This will make it so we won’t be getting distracted or annoyed when we’re trying to read. 2) Of this is not possible to do make it so instead of making a constant banner ad in the articles a small to medium ad in a natural breaking point in the article that we can scroll by. So we’re still going to see it but it’s not forced on us 100% of the time. Data and documents take about 1GB and continue to grow incessantly. Must have an option to clean old stuff. Professional, unbiased reporting without the fussy underpinnings. 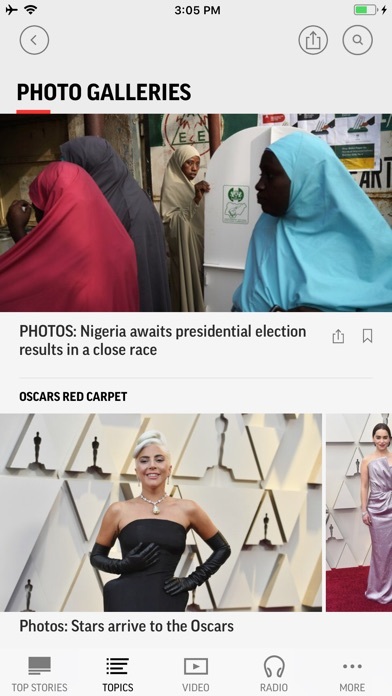 Favorite news app so far. UP Has great interesting stories and the best part is they are very unbiased unlike CNN and Fox News. Seems to be put together by committee -it often displays the same article in different categories. I assume this is just to take up space. The hunted pack method of finding a category from that list you call a menu is just ridiculously Time consuming. The reporting however is excellent. The old app was so much better. I used to be able to filter what I saw, that feature is not available on this one. Great app with one catch: the banner add at the bottom expands to a larger video every 10 or so seconds which is pretty dang annoying and stops the music I’m listening to as well. Would be a great fix to have it pop into the video maybe once and not stop the music. Thanks! Used to be my go-to news app. I have no idea what happened, but now it freezes continuously but not consistently. I can read some articles and some freeze before I finish a paragraph. Sent a contact request and got no response. Too bad, I liked this app to get my news, looking at different apps now. Reboots and reloads don't fix the problem. Just got my first apple product, an iPad. 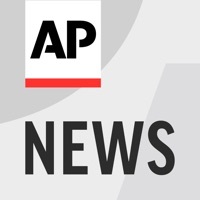 Loaded my favorite news app, AP News, and immediately noticed the half inch moving ad bar at the bottom of the screen. So distracting it makes the app unusable. The ads are not present on my Samsung tablet using the android app. I noticed lots of ads in the App Store too. So far disappointed with apple. Hate the distracting animating ads that pause my music constantly. Let me pay you! The AP is the source. If you want the real sauce, go to the AP. I would like to give this app five stars for all of the same reasons other users have rated it well. However, the buttons at the bottom of the display screen are not accessible through voiceover. Thus users who are blind cannot use the app in all its splendor. Happily, if you just want to review the stories of the day, they are accessible through voiceover. I hope developers will make this easy change. Apple gives simple tools for developing accessible applications. Video advertisements are now randomly expanding over the content. It used to stay in the bottom in one place. Absolutely spot on and very timely reporting. You can count on this for up-to-date news. The ads, especially the video ads that pop up and enlarge as you are reading, is really irritating. Now I go to BBC or Reuters first before AP app. I’d like to see a bigger helping of world news. I have just begun to monitor your app and I really like the fact that you just give me the facts and allow me to make my own opinion as to what they mean. It is refreshing! Thank you! More graphics driven advertisements have led to reduced functionality. 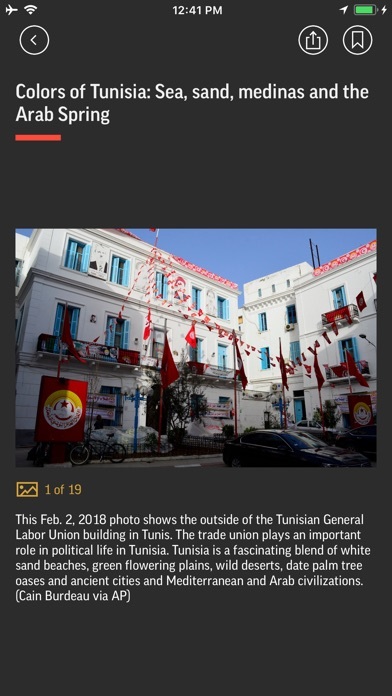 Often lags for 3-5 seconds when articles are selected now. Multiple crash issues have been occurring. This app was my go to for years until something recently changed. Please fix! Great news but the ads are horrendous. I’d pay to have the ads removed! They make the app so slow. Didn't load as fast as older version. Also inexplicable crashes/freezes. Always great reporting but bad editing by marketing engineers. Stories jumbled together. Don't see why sports and entertainment mixed in. Ads mimic stories and take up too much space relative to any value they might possess. News value of AP is a 5 but the marketing engineers get zero. I’ve tried a lot of news apps but this is currently my favorite. I stopped using the CNN app because I got tired of the silly and subjective news alerts. The Associated Press does a much better job of reporting real news as objectively as possible rather.